Once again, when Fox News are able to actually provide a rolling news service, they excel at it. Even if a reporter looks a complete idiot for doing lives while gusts of 90mph are blowing across. The presenters on WECT just mentioned that staff who don't need to be in their building have been moved out, and the people working on the round-the-clock output are sleeping in the vacated offices (some of which have started to leak a bit). A reporter mentioned earlier that he'd heard from a neighbour that a tree was down in his garden but it thankfully hadn't hit anyone's house. A good reminder of how the local journalists are personally affected by the story they're covering - their professionalism is incredible under the circumstances. Laura Trevelyan has just told Philippa Thomas on BBC World News that the storm has physically removed the trousers from a fellow news reporter who's reporting the story near Laura. 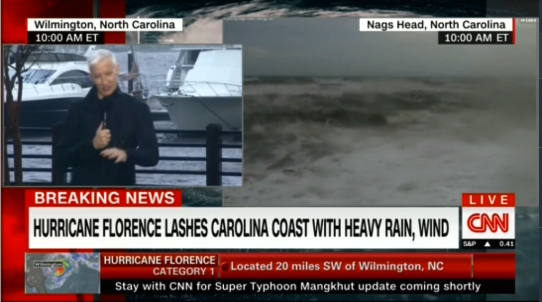 CNN International at 1000ET/1400GMT, just after a promo for iDesk coming next, however it's still a domestic simulcast, but a flipper at the bottom with info about Typhoon Mangkhut has been added this hour. I saw some WECT too. Very, very good. 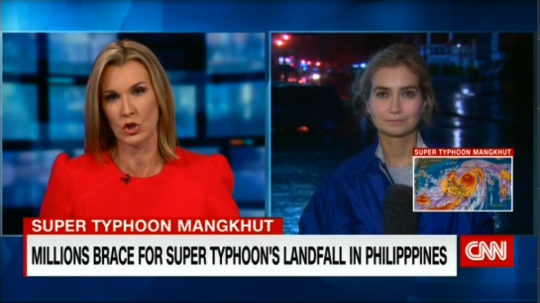 Robyn Curnow (who would normally be on air with the International Desk now) with a Typhoon Mangkhut update on CNN International during the break in CNN's domestic coverage. CNN US also having to balance the Manafort coverage, being presented from New York. Rolling coverage hasnt started yet. WCTI NEW BERN, NC was evacuated. The station started to the flood and they sent the other reporters and anchors to other sites. But the 2 meteorologists stayed behind alone at the station to keep doing to what they could to keep informing the public. WOW! Prayers for our sister station.- WCTI Water is up to the doors of the station. Everyone except the meteorologists are evacuating. Here the meteorologists sign off before leaving the station. Apparently now they have a back up site established and the entire crew is all back together but is shows the commitment these little tiny stations have to keep their communities safe. Apparently New Bern is inundated with flood waters. The situation is pretty bad there. Remember all these stations have been in rolling coverage all night and still are going. Pretty impressive. Hala Gorani Tonight and Quest Means Business aired as normal on CNNi tonight, presumably so they could give a fairer amount of coverage to Mangkhut as it made landfall. This seems to be the equivalent of NFL Red Zone (they're even calling it Hurricane Red Zone), with coverage hopping around from station to station.